Breyers commissioned Chef Antonia Lofaso to create some delicious recipes using their ice cream (though Breyers is already quite yummy on its own). Here’s one of the Breyers ice cream recipes Chef Lofaso put together. You just need a carton of Breyers vanilla ice cream, some sliced pineapple and a bit of toasted coconut flakes to whip up this tasty treat in about 10 minutes. The recipe makes two servings, but you can easily double (or triple) it to suit your needs. 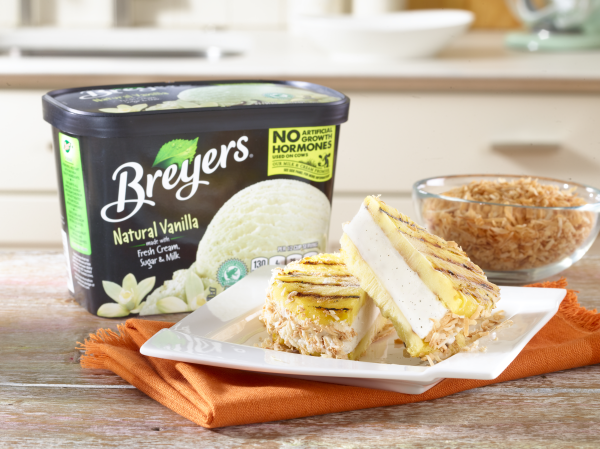 Sandwich the softened Breyers Natural Vanilla Ice Cream between the two grilled pieces of pineapple. Coat sides in toasted coconut. What’s your favorite flavor of Breyers ice cream? Get a Free Oil Change with Secret Shopping!